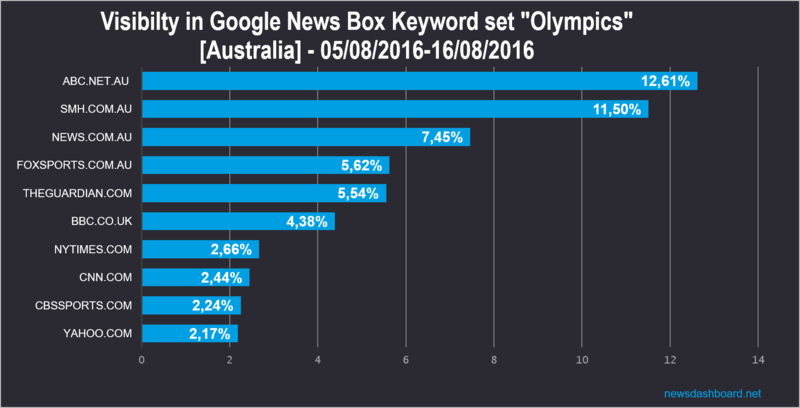 Olympic games – which news publisher wins most of the Google News Boxes in Australia? More than half of the Olympic Games are already over. Five days are left. The Australian athletes won seven gold medals so far. Three of them at the swimming competitions. They also were successful at rowing, sailing, rugby sevens and shooting. We wanted to know which Australian news publisher has the highest visibility in the Google News Boxes. Therefore, we created a set of keywords around the Olympic Games and analysed the corresponding News Boxes between the 5th August and 16th of August. Before looking at the data created by the Trisolute News Dashboard, we cast a glance at Google Search results page around the Olympics itself. As the following screenshot shows, Google has developed a special information chart for the Olympic Games. 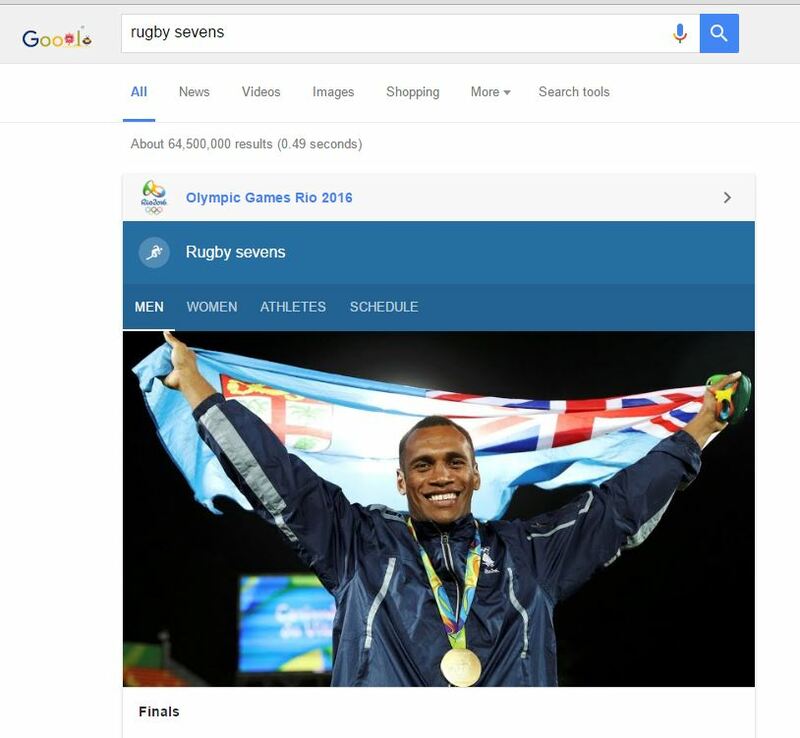 It can be found at the top of the SERP (Search Engine Result Page) and contains information for the corresponding keyword (in this case: rugby sevens). This leads to the assumption that Google News “withholds” some traffic from the news publishers, because the Google News Boxes with the latest articles for Olympic keywords are further down on the SERP, and the users can get their information straight from Google. The following graph shows the top 10 news publisher concerning visibility in the Google News Boxes Australia during the Olympic games in Rio. Abc.net.au is the winner of the Google News Boxes about the Olympic games between 05/08/2016 – 16/08/2016 with a visibility of 12,61percent. But smh.com.au is very close behind. Both of them are really strong. With a good distance news.com.au is on the third place with 7,45 percent visibility. Foxsports.com.au, theguardian.com and bbc.co.uk are close together as well and are following at the places behind. An interesting fact is, that bbc.co.uk, nytimes.com, cnn.com, cbssports.com, yahoo.com are all not based in Australia. These big news publishers from the US and the UK are playing also an important role in Australia and get a lot of Google News Boxes there. To sum it up, abc.net.au and smh.com.au are pretty strong at the Google News Boxes for our “Olympic games”-keywordset. News.com.au had also a good amount of Google News Boxes. A lot of non-Australian news publishers could get Google News Boxes. 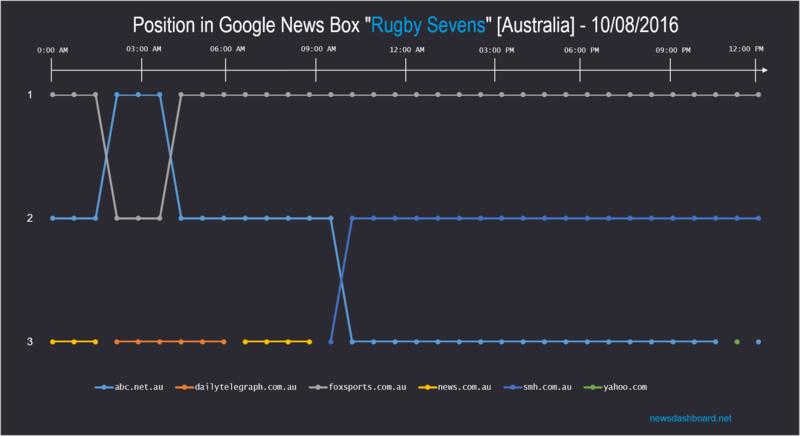 At the day of the Rugby-sevens-quarterfinals, foxsport.com.au stayed almost the whole day at the Google News Box for “rugby sevens” on first position.